VW Officially Unveils First Full Electric Car e-up! VW has been talking about electric cars for sometime but have never delivered anything. Today, the company officially announces its all-electric e-up!. We’ve heard plenty of conflicting messages from the German mega-carmaker Volkswagen in the past when it comes to the electric drive. At first not a believer but seeing the market heading in this direction, the VW group has since then been working on a few hybrids, even a plug-in hybrid and finally, the one we’ve been waiting for, the all-electric e-up!. Official Unveiling. The VW group chose its Annual Press and Investors Conference in Wolfsburg to officially unveil this little electric car we’ve heard so much about in the past but feared it would never be made available. The company’s first full electric car, the e-up will hit the European streets first early 2014. Technically Speaking. Using a 60 kW (82 HP) peak electric power, its continuous power rated at 40 kW (55 HP) should be enough to get the car around city and congested highways. With a maximum torque of 155 ft-LB immediately available, the 0 to 60 MPH is reached within 14 seconds with a top speed of 84 MPH. The battery pack is made up of lithium-ion cells lodged under the floor rated at 18.7 Kilowatt-hours (kWh). All of this means theoretically, the e-up can cover up to roughly 93 miles on a charge, according to the European cycle test. The e-up! is svelte, weighing in at 2,612 Lbs. Battery charging is accessible from the e-up!’s hidden ‘fuel filling flap’ using the Combined Charging System (CCS), which supports both DC and AC charging. VW & The Electric Car. How serious is VW with alternative energy cars? If you would have asked that question two years ago, the answer would have probably been that they were just observing, but had a strong preference for their cherished diesel technology. However, seeing the market shifting toward more electric drive making its way into everyday cars with hybrids, VW understood the need to offer the same as everyone else, a hybrid, in this case with the Jetta, a plug-in hybrid (PHEV) still being tested and finally a real fully electric car called the e-up!. VW is dealing with the introduction of its electric e-up! intelligently by portraying it as a: “A car for daily use in the city − but it is also ideal for commuters or as an innovative second car” This says it all, the automobile industry is maturing and is tweaking their marketing campaigns to show electric cars as what they do best and not pin them to their gasoline counterparts. 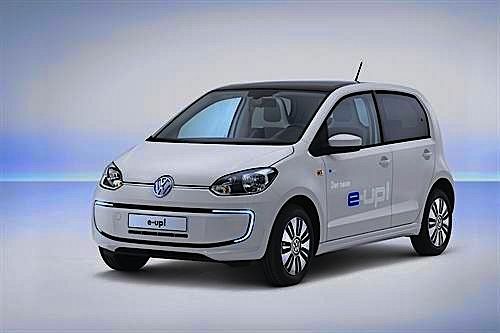 Congratulations VW on your electric e-up!.